Are you guys on turkey detox? Are you still in your fat pants from your Thursday feast? Yeah. Us too. So we know what you all are thinking, we know you too well. "Masculine spaces??!?!?!?" Yes. Masculine spaces. When we ask you what first comes to mind when you think of a masculine designed space, what would it be? Ok. We will help you out. 1. Large flat screened TV. 2. Ceiling Fan. 3. Another Ceiling Fan. 4. Place to lay their crap. 5. Dude stuff. Ok. Let me address one subject. What is it with the man and his ceiling fan? We do not get it. Every client we work with it is the same conversation. Us: "What about a chandelier in the bedroom?" Client: "OMG I would LOOOOVEEE a chandelier in the bedroom...BUT my hubby will not budge on the fan." We almost don't ask anymore. Swear. This is an anomaly that we have come to terms with never solving. Ever. Boys are weird. 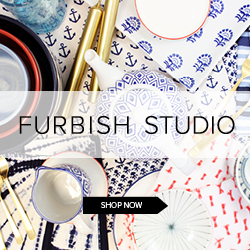 Anyway, not all masculine inspired spaces have to go the route you are envisioning. With applying dark, metals, organic and simple natural elements, we have ourselves a masculine space. Let's take a gander at some awesomely masculine spaces where we wouldn't mind laying our heads down at night. As you are all FULLY aware, fully, we love black walls. Black lamp shades. Blackcents galore up in this space. We love how they incorporated the mixing and matching of different wood finishes, as well as, some elements from nature. Animal remains (sounds gross, we know). Ok, the cool turtle shell and the antlers of some sort. Glam it up with a chevron comforter. Super tailored masculine space. Love the marriage of the blacks, greys and cognac. 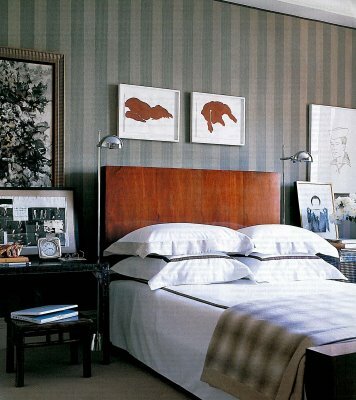 As you can see, a great usage of pattern in this room to create layers, yet it is still so simple. Not fussy. I will tell you what I am about to fuss about. That headboard. OMG. I would definitely take a ceiling fan for that headboard. Mary MacDonald...you have done it again. Is there anything this woman cannot do? Leather accent wall adorned historic relics. A man's dream I tell you. 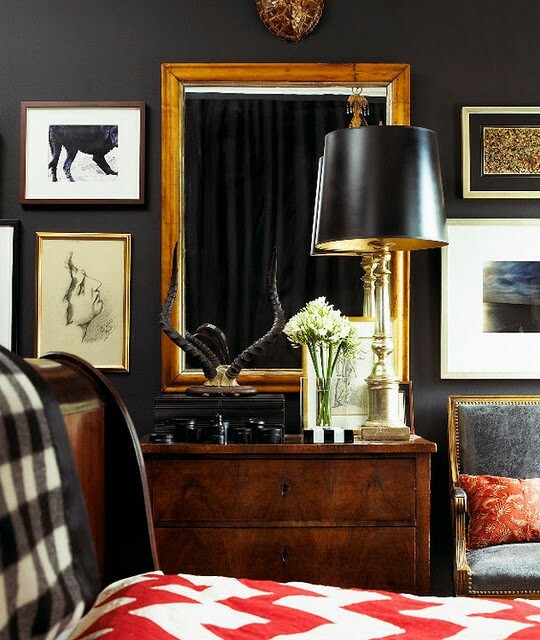 Gorgeous dark and rich colors absolutely make this room. Total modern masculine bedroom. We love how the beige color palette is complimented with all of these chrome glamorous touches. Ok, sorry guys. Manly touches. Clean lines in this room will definitely get the nod from any guy. Not to mention the overly cool light fixtures. Another chromey masculine bedroom. Again we have the blackcents up in here. What guy wouldn't adore that? There is huge usage of blackcents in this space. Lighting, walls and the majority of the furniture. Super elegant, yet so manly. I have adored this bedroom ever since the first time I laid eyes on it. This makes me think of some marvelous cottage in Vermont. The large black wooden framed bed is to die for. Not to mention the plaid accent. We cannot get enough of plaid lately. Also so dear, the 3 matching shields displayed on the wall. We die. Equestrian chic. Adoring the striped walls. The vertical stripe gives the space a more masculine feel. Not to mention the soft color palette. 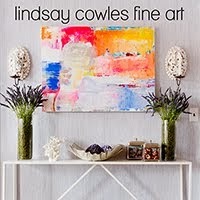 The art chosen to adorn the wall definitely does the trick of making this space more gender specific. We love the use of simple elements here. Like we could finish this post without incorporating antlers. Are you kidding?!?! This room is obviously cabin appropriate but we couldn't help but show it off. 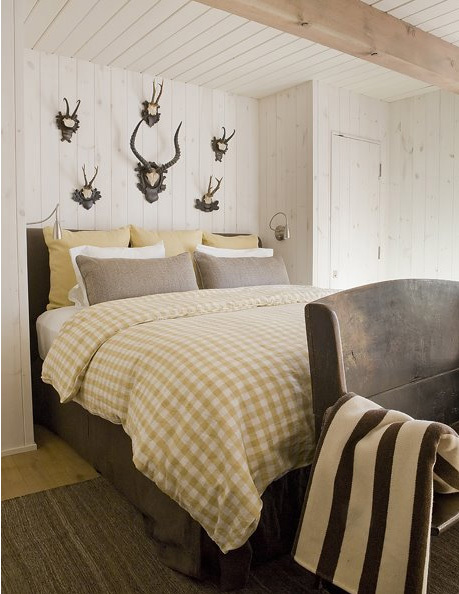 That rustic, reclaimed wood bed is absolutely insane. Nusto. 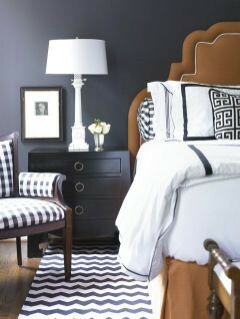 I love masculine style for a bedroom. That third image is insanely gorgeous. Equestrian chic will always have my heart! Beautiful rooms! 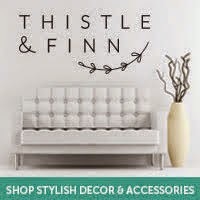 Love this post and love every single picture, I do like a masculine tailored look to a room, it really is fabulous lookikng. Great post!